Small Class Sizes and 21st Century Skills. We created this landing page in order to help parents better understand how St. Peter School intends to use Google and to help you access your child’s Google Classroom page. 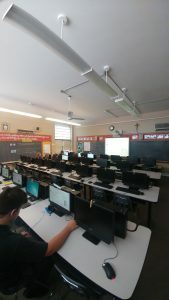 During the summer of 2017, St. Peter School deployed Google’s “G Suite”, which is uniquely tailored for educational institutions. All teacher email accounts are now coordinated through the G Suite, and usernames and passwords were set up for our students. We believe this will create ample opportunities for teachers to employ instructional technology within the classroom, cultivate 21st century learning skills among the students, and also provide for greater communication tools between parents, students, and teachers. Additionally, St. Peter has taken steps to begin purchasing Google Chromebooks so that students and teachers can utilize technology to a much greater extent in the classroom. With these new upgrades, however, comes a heightened sense of responsibility on the part of teachers, parents, and students. Earlier this year, the school sent home its Acceptable Use and Guideline for Electronic Communications forms. Students and parents are required to review these forms, sign them, and return them if they expect to make use of technology available at St. Peter. All teachers are expected to have, at a minimum, a basic Google Classroom page set up. The purpose on this level is for communication with parents and students. The page should be updated at least weekly with announcements indicating assignments that are due. As the principal, I can view and access all the pages. Teachers will be undergoing continuous professional development plans this year to explore ways to use Google Classroom to a wider extent. How quickly individual teachers can grasp and assimilate these strategies will determine to what extent a given teacher will use Google Classroom. Some, especially on the lower grade levels, may use it primarily for announcements and as a parent-teacher communication tool. In the middle school, however, you might see extended applications such as the use of Google Drive for writing assignments, Google Slides for presentations, actual assignments to be completed on Google Classroom (and graded there), and much more. One nice thing about Google is that students can access their applications (Drive, Slides, etc.) from any device as long as they have an internet connection. In most cases, there is no longer a need for a flash drive and teachers can access important documents for monitoring. All students have been assigned a username and password, grades Pre-K through 9. See note below about student email accounts. With respect to passwords, parents must consult with the teachers if your child has not recorded this in their agenda books or elsewhere per teacher specifications. Grades Pre-K through 4 have a standardized password that is the same. Students in grades 5-8 have been asked to change their standardized passwords and we have recorded them. All teachers- technology, homeroom, and departmental, have access to the passwords for grades 5-8. You can always email your child’s teacher for the username and password. Homeroom teachers for grades Pre-K -4 should easily be able to give you your child’s username and password so you can access Google Classroom for that grade level. Note of caution: under no circumstances should any student in grades 5-8 share their password with another student. Restricted internet browsing. When logged into their St. Peter’s account, students should only be able to browse safe content according to Google’s restrictions. Disabled Incognito Browsing. Students will be unable to use this feature to browse the internet without recording internet browsing history. Browsing history- they are not able to delete browsing history while logged into the St. Peter google account. Email App. In order to be consistent with the Diocesan Social Media Policy and protect our students, we have disabled the Email App. At present we have found no substantial benefit for students to have a school email account so as to outweigh potential problems. Other Google Applications: Drive, Slides, Classroom are safe apps that have a direct application to the instructional purposes and confirm to our Social Media policy. These will remain enabled. YouTube content is set to Heavily Restricted. Most videos will not be permitted and teachers will need to directly approve them. A record of “approved videos” by teachers is maintained by the Principal and will be reviewed. Teachers have the ability to manually approve videos that they deem relevant to the class. Any parent who questions the content of a teacher approved video should contact both the teacher and the school principal for review. As with any application, the school reserves the right to suspend an application if concerns arise that were not previously considered. Watch the video below for additional instructions by Mrs. Marisi, our technology coordinator.